Teeth whitening (or bleaching) is a non-invasive dental treatment used to lighten the color of natural tooth enamel and is a simple way to enhance the beauty of your smile. While chairside whitening is popular and can deliver instant results, it is expensive and the results short-lived. On the other hand, over-the-counter teeth whiteners have proven to be disappointing for most consumers. Dr. Huiras provides this highly effective professional-strength take-home teeth whitening in Paso Robles, CA. Our patients have achieved excellent results with this treatment. In only one week, this potent but gentle bleaching gel delivers significant whitening. Customized trays keep the solution on teeth while actively bleaching, and special ingredients are included to reduce or prevent sensitivity. Less expensive than in-office teeth whitening but just as effective. 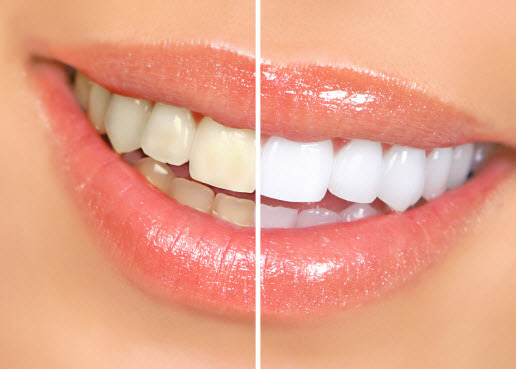 Permanent (intrinsic) discoloration does not respond well to teeth whitening. To conceal deep stains, direct bonding or porcelain veneers are needed. If you have deep discoloration or any of the above conditions, bonding or veneers may be right for you. Dr. Huiras works closely with patients to make receiving this treatment affordable. If you have a combination of concerns, he can combine full veneers and bonding to renew your smile. It takes two visits to receive porcelain veneers. At your first appointment, a precise impression of your teeth is obtained to send to our trusted lab. On your second visit, these thin, custom-made ceramic shells are securely attached to the front of the teeth being treated. Bonding can be completed in one appointment. This is a simple procedure in which a resin material is applied to the tooth or teeth, and shaped to create a natural look. The team at the dental office of Dr. William Huiras is ready to answer your questions. Contact our Paso Robles dentistry to learn more or to schedule a consultation.